I did not make it. On the morning of my flight, my car would not start. The starter is under recall and I put off replacing it because it never failed for something important before. Just once in a while, it fails to start, then hours later, it starts like nothing happened. The flight and hotel were non-refundable. It is time to get the damn starter replaced! Despite the financial hit, I felt like I got a reprieve. Weird, huh? It bothered me that I could not go and I must admit that thinking about my son criticizing me for not coming added to my sense of dread. Why, when he will not talk to me? I spent most of the day sleeping, but I needed it because I was so anxious the night before that I could not sleep. I spent late Thursday and most of Friday dickering with my pastels. I bought some pads on sale and did not realize that all of the paper was black. My initial sense of dread evaporated as i began to experiment with it.My mind is reeling with ideas on how to use this black paper and I am discovering several things about my techniques that I have to improve/change. Since I am genuinely learning, it feels better again. Now, 'mediocrity' does not matter so much when I can look at something and know what I learned. Yes, Teal, you worded it right: the medium is teaching me. 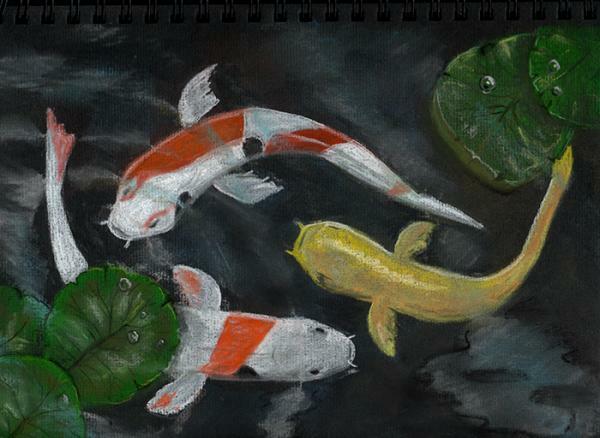 I love learning, which is probably why I am so excited about working with pastels again. something if it causes dread and anxiety. I am glad that it turned out the way it did. I heard (via an email) that there was a torrential downpour and the 'graveside' service had to be conducted indoors because they were afraid that the awning might collapse from the weight of the water. I am not sorry that I missed that. That sounds like fun to have to adapt to the black paper, and very good pictures, too. 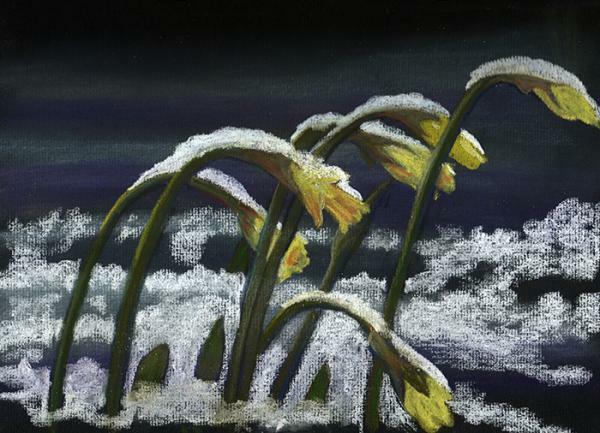 The daffodils in the snow in particular. Good thing you had mixed emotions about going on that trip, because think of how disappointing it would have been to have car trouble that kept you from something you were looking forward to. It has, however, motivated me to do something about my starter. Yes, I like working with the black paper. I've already done more this week then I did all of last year! I am glad you did not have this ordeal. Enjoy some drawing on black paper, both of these pictures seem quite right on black. One is supposed to be able to do full-color (entire page covered) on the black paper but all of those come out too dark. Those techniques are the ones I most need to learn. It seems that unseen hands step in and make decisions for you. Anyway, it's done. You didn't go. Move on. Sometimes the oddest coincidences lend themselves to new beginnings. Years ago I started dipping a watercolor brush into India ink and discovered bold strokes that gave my stuff power. So the medium was teaching me. And once I put a sheet of paper on a mimeograph drum and traced a drawing with my fingers. The pattern of the drum contributed a surreal effect. Drawing with my non dominant hand also gave me insights. It's all fun, though.